Every parent to a furry pet knows how much of a nuisance fleas can be. At best your pets become itchy and skittish, at worst they become miserable and lethargic. And just like ticks, fleas can be a vector for disease for your pets, or even for you! Fleas can be partly responsible for roundworms or flatworms, and can be responsible for infections including typhus, spotted fever, cat-scratch fever, or more rarely, the plague. So what can we do? The best first step is prevention, but if that fails, there are ways to spot the beginnings of a flea infestation as well as ways to stop it in its tracks. Keep your home clean. Vacuum your house regularly, especially if you have deep pile rugs, and make sure your pet's favorite spaces are regularly cleaned/washed, aired out, and preferably getting plenty of sunlight. Use flea treatments. 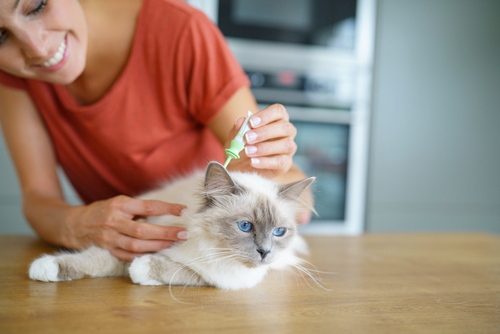 There's a number of options for flea treatments available based on the type of pet and their age, including spot-on treatments and flea collars. Always read the instructions carefully to avoid harming your cat instead of helping them. 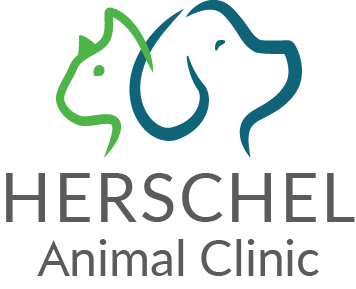 And of course, always feel free to come in and talk to our staff about what treatments are best for your pet. Consider professional pest control. This option isn't always in a pet owner's budget, and it should always be considered carefully to ensure the best health for your pets, plants, and fish. This can also help prevent other potentially nasty bugs from biting you and your animals, including mosquitoes. Sometimes, despite our best efforts, fleas find their way into our homes and onto us and our animals. Maybe it's because you live in an apartment, and they hitch a ride on your neighbor's dog. Or perhaps your selected flea treatment didn't last as long as you expected it to, or wasn't even effective at all. No matter the reason, we've got a few tips on how to identify a flea infestation as early as possible. The earlier you identify it, the earlier you can get it under control! Comb your pet regularly. You can monitor your pet's fur for fleas at multiple stages and check their skin for irritations, bite marks, or other signs of fleas, such as eggs or detritus (blackish-red "flea dirt"). You want to pay close attention to favored locations, such as the back of the head and around the ears, the armpits, or the rump. Remember: fleas will jump on and off of you and your pet, so finding signs of fleas is important, even if you do not find fleas themselves. Fleas love to jump. Fleas are tiny and quick, but they usually appear in groups once the infestation has started. You'll probably be able to feel them jumping on and off of you, especially your feet and lower legs. Your pet's skin will probably also "jump," as they twitch from the movement of fleas (as opposed to being bitten). Keep an eye on your pet's behavior. Are they scratching more than usual? Are they pulling their fur out? Do they have dermatitis? Are they biting at the same area over and over? These are all potential signs that fleas are present. Note: If this behavior is present, but you cannot find any other signs of fleas, bring your pet in to be checked by us. We can ensure there are no other health problems! White brings fleas to light. 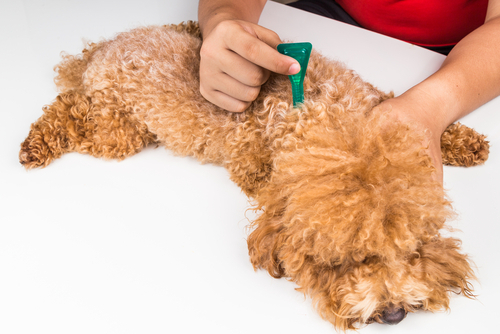 Sometimes it can be hard to determine if the evidence you're finding is of fleas, instead of just plain dirt, especially if your pet spends a lot of time outside. Put down white paper towels when you comb your pet with the flea comb. You can check the detritus that falls off the pet onto the paper towel or is stuck on the comb to see if it's like dried blood, or if it looks like the earth around your home. Also, if you wear white socks, you'll be able to see the fleas jumping on and off of you. Fleas don't just jump on you. In fact, individually they don't even spend most of their time on you or your pet. Check your pet's favorite places — the dog bed where they love to flop, the spot on the overstuffed chair where your cat loves to sun itself, or even the places in the house where they play the most. Fleas will leave behind similar detritus on your surroundings as they do on your pet. Check all of your pets. If one pet is exhibiting signs of fleas, but your other pet's behavior hasn't changed and they don't scratch themselves much, that doesn't mean the fleas only want to eat one pet. There is a good likelihood you'll find evidence of fleas on both! The reason is that not all animals are allergic to flea bites. Anemia is a concern. Be sure to keep an eye on your pets during regular care and grooming. Lethargy, weakness, and even pale gums can be signs that they're anemic, i.e., that a high number of fleas are sucking their blood. Be sure to come see us so we can get your pet well! The fleas have gotten past your defenses and into your home. What now? How do you and your pet stay healthy and put an end to your misery? Attaining the best results is going to depend on the severity of infestation. After all, just giving your pet a shampoo treatment isn't going to help if there's already eggs, larva, and adults living in your carpet. At a certain point, a simple house spray may be enough, or a carpet treatment, or you may need both. Of course, if the infestation is very severe, you may want to talk to your vet about the risks and benefits of certain types of solutions. Sometimes people mistake monitoring tools, like flea traps, with infestation control. Flea traps cannot treat the source of the infestation, be it your pet, your yard, or something else, and they cannot even trap the majority of fleas in your home. They also won't do anything to prevent new larva from hatching. The first point of control should be your pet. Even if they aren't the source of an infestation, this will help mitigate discomfort and health risks. Be sure to talk to us about your options! A once-monthly oral medication will help interfere with the early life stages of new fleas. Spot-on treatment can protect your pet's entire body and kill adult fleas on contact. You may want to use a flea shampoo, which will only last a couple of weeks but will immediately kill all the fleas on your pet as well as protect your pet over time. In severe situations, a dip, much like a shampoo, may be required. If not used very carefully, dips can be hazardous to both you and your pet. Remember to keep combing your pet. This will let you know if the selected treatment is working as expected. You should also regularly vacuum to prevent flea eggs and larva from settling in, as well as regularly clean bedding, etc. However, treating your animal won't be enough. Treating your home and your yard are important steps to ensuring the fleas are gone for good. This is likely to require a combination of treatments — after all; no one treatment can cover everything. This may require a bit of spending, but it will definitely require patience. Hiring professional exterminators will work as well. They will be trained in what to look for in your yard and home, and have the tools necessary to fully treat your home. Flea bombs sound like the best all around treatment because, like other bug bombs and foggers, it fills up the space of a room. It does require multiple bombs to treat multiple rooms. However, the downside is that it leaves some areas untreated (e.g., inside closets, drawers, or cabinets, or even underneath some kinds of furniture) and leaves a residue that can contaminate food. Anti-flea sprays are available that can be used on carpets and furniture, and some are even multi-use sprays that can be used on your pets. (Always read the instructions! Using one that's furniture use only on your pet can make them sick!) However, the length of time these sprays last is very brief, meaning you will have to use and buy these products often. Another option is carpet powders which are spread out on the floor, allowed to 'rest' like waiting for a flea bomb to completely expend itself, and then are vacuumed up. These are harder to come by, and often are not available in regular stores, but they are long-lasting and kill fleas at every life cycle. Unfortunately, you cannot spread it on furniture, and it needs to be vacuumed thoroughly. When it comes to your yard, there are a few natural options that may help, but cannot be guaranteed, including using cedar chips or Pennyroyal herbs as a repellent and spraying nematodes (which do not affect humans or pets) on your yard. Flea insecticides are also available for your yard. Like indoor treatments, you should always read all the instructions and follow them carefully. Remember to protect yourself with gloves and a dust mask. You'll need to cover the whole yard, so make sure your pets and/or children don't play in the area until the process is finished. You should never rely on one method to kill fleas, and never only treat one area at a time. This will inevitably provide a small percentage of fleas sanctuary, which in turn will lead to a new infestation.